Turquoise has long been referred to as a sacred stone by many cultures. Native Americans in the southwestern United States believed this stone was a gift from the gods. While people today still believe in the energy of the stone. It’s known to provide good health, happiness and fortune to the bearer of the stone. It’s also been used by healers and medicine men from around the world to heal many types of aliments. Chakras: This stone is said to open all Chakras. 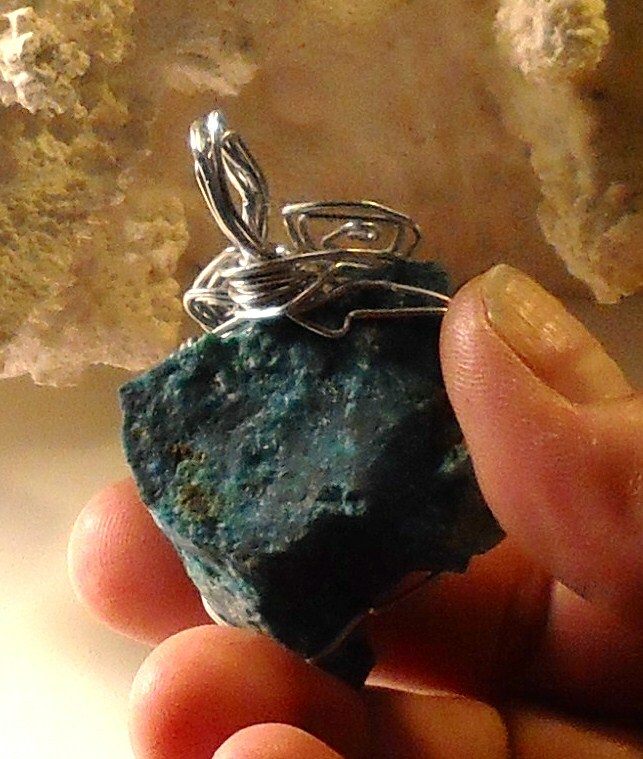 Beautiful Natural Uncut Raw Turquoise, Hand Wire Wrapped in Silver Wire. 16.57 grams, 82.85 ct, Size: 27.79 x 20 x 14.60mm. Would look fantastic hanging from a Simple Chain, Rubber or Chinese Silk Neckcord. If you are looking for a particular stone, we would be happy to help you find it. Our supplier has an assortment of Uncut, Tumbled and Cut & Polished Natural Stones. Custom Orders always welcomed. We can create a custom piece for you with the rock pictured here or the rock of your choice. Just send us an email with your request. Another Designer Original from Jewels Designs. Only sold on our Yardsellr Page. Check out this Pendant and all of our other designer art at Jewels Designs Yardsellr Page. One-of-a-kind. No two pendant alike. Would make a great Mothers Day and/or Birthday Gift. Beautiful Natural Uncut Amethyst Stone Pendant, is Hand Wire Wrapped with Amethyst Alloy Wire. This unique piece would look fantastic on a Simple Chain, Rubber or Chinese Silk Neckcord, or a Custom Design Beaded Necklace. Custom orders are always welcomed. If you are looking for a particular stone we can probably find it for you. We can custom design a neck piece for you with the stone featured here or any stone of your choice. This is a another Designer Original, from Jewels Designs. Sold on our Yardsellr Page or our Face Book Profile Page (not sold on our website). This would make a perfect Mothers Day and/or Birthday Gift. Check out all of our Hand wire wrapped stone on our Yardsellr Page. Free Shipping US Only. $7.00 Shipping out side the US. 63 grams, 315 ct, 3″ long. One-of-a-kind. Large Clear Quartz Crystal is SOLD! Beautiful Madame Clara Ward Bracelet is from our Madame Steampunk Bracelet Line. It’s 7.5″ long, and is made with Gunmetal: Findings and Connectors, Ox Gold: Rollo Chains, Braided Toggle Clasp and Key Charms. Finished off with a large Tangerine Amber Cab and Rock Glass Beads. This is one of my favorite pieces and I’m sure it would be one of yours. This is a Designer Original from Jewels Designs, and is a one-of-a-kind piece.